Disclosure~ This is a sponsored post on behalf of US FamilyGuide and SchlitterBahn Water Park and Beach Resort located in South Padre Island, Texas. My family and I received a complimentary 3 night stay at the resort and 2 day admission to the indoor water park in order to complete my review. :) All the pictures in this post are taken by me or my children. I know what you are thinking THE BEACH in the middle of winter!? !...BUT wait SchlitterBahn IS a beach paradise featuring a 221 room resort hotel, indoor water park, full service restaurants and more.. Schlitterbahn Beach Water park and Resort is the perfect combination of family adventures and state-of-the-art attractions, right on Texas' favorite beach. Experience the beach atmosphere, unique mix of attractions including a great carousel and the award-winning Torrent river system. Schlitterbahn Beach Water park and Resort is the perfect Beach Holiday. Book Yours Today! The water at the beach was so clear and beautiful! The temperature was in the mid 70's!! Of course being from north Texas ...the first thing I had to do after we checked in was to RUN to the beach. I just had to put my toes in the soft warm sand! When we left Wichita Fall the highs were in the 30's! We arrived around 430PM on Friday. Although the indoor water park was closed. (The indoor water park is only open on the weekend during winter season.) The kiddos and I had a wonderful evening on the Beach. It was the first time my kiddos had been to a beach. We played in the Ocean catching waves and collecting seashells till after dark. Jessica sticking her feet in the water for the first time! With in minutes she had ran back to the room to change and was swimming in it! Look how clear and clean the water is! The water temp was great to go swimming! This was the pier we had to walk down to get to the beach. It just a few steps from our hotel! Jessica was picking up seashells and I went swimming! That evening we had dinner at the Seaside Grill. The Seaside grill is right on the beach!! The meal was awesome. We had chicken strips with fries and a great tasting Chocolate sundae. During the meal we could hear the waves of the ocean. It was so quiet, peaceful and relaxing! After dinner we walked around the resort. SchlitterBahn was decked out for the holidays! On our second day we went to the indoor water park!! It was only a few steps from our room and in and the same building!! There was a play area for the little kiddos! My kiddos Luved the 2 indoor slides! Jessica and Anthony floating down the lazy river! Inside the water park was a 3 level Mega Blaster ball area! This was my kiddos favorite place to hang out when not in the water! The boys were shooting across at each other! Jessica found a bucket and filled it up often with "ammo".. The kiddos explored and used every ball blaster on each level. 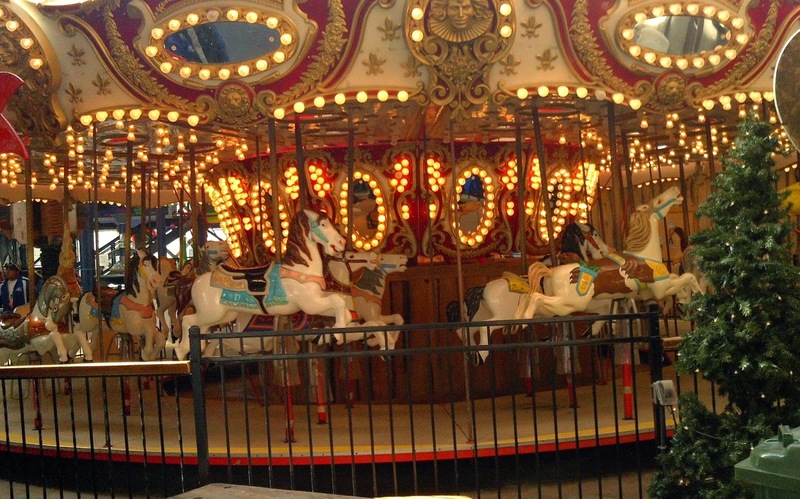 There was also a HUGE carousel inside the water park! The indoor water park includes picnic tables for parties and get together for events! On Sunday, I hit the beach early so that I could catch the sun coming up! Check out these BREATH taking views! After watching the sun coming up, I woke the kids up and we drove to the Sea Turtle Rescue Center before the water park opened for the day. The Sea Turtle rescue center is located just a few minutes from the resort on the island. Sunday was our last full day on the island. We enjoyed the water park until it closed :) Then, we hit the beach one last time for set of photos. My family and I had a wonderful time! The kiddos are already asking to go back! They enjoyed seeing and playing at the beach! Jessica collected many different seashells. We all have memories to last us a life time! If you need a Holiday vacation consider Schlitterbaun Beach resort and indoor water park in South Padre Island, Texas. They offer great discounts of up to 40% for multiple day stays. The indoor water park admission is included in the resort stay and the beach is open 24 hours a day to enjoy from the guest entrance. My family and I liked that it was not packed because it was the off season. The hotel was clean and the beds were HUGE! Our room had awesome views of the beach in all directions! Each room includes free wifi, big screen TV with cable, a mini fridge, microwave, safe, coffee maker and coffee..There were also a washer and dryer for guests to use! There are many other areas of Schlitterbahn beach resort that I didn't cover in my post including the heated outdoor pool with the swim up bar and many other restaurants that are available to guests. You have to go to check out the beach resort for your self! Schlitterbahn Beach Water park and resort has something for everyone in the family to enjoy. Book Your Beach Holiday Today! Wow awesome trip, so much you guys did, how much fun, I can't wait to go on our next trip, always great to explore new things and areas. Sounds like alot offun. i have nevr been to a beach either, except my local ones. would love to go somedy! Sounds like a great time! I wish we had stuff like that around here! Maybe one day we'll head on down to Texas and check it out! Looks amazing! I want to go! So cool you got to review it and get a family vacation. This is like a little oasis! Thanks for sharing the information about it! This looks like a neat place for the kids! @Kim ~ There is one is San Antonio? It looks like you and your family had a blast. What a fun idea for a vacation! Wow, looks like a fantastic family vacation spot, kind of like Great Wolf Lodge. Very nice. I may have to add this to my list of vacation spots - especially during winter. Schilitterbaun! I grew up in San Antonio and have many memories of the place. A few years ago, I was visiting family in Texas and we went for their Christmas event, though I don't know if they still do the Christmas events anymore. I have been to Great Wolf Lodge, but not to SchlitterBahn. They look very similar. I wonder how they compare. Thanks for sharing. I know my kids would love it! I like all of your pictures. This looks like so much fun! I am so glad you and your family had a good trip! I love Texas and can't wait to go back! It's been far too long. This looks like such a great vacation. How fun. I wish I could go to the beach in the middle of the winter. :D It's been so cold, it would have been a nice escape. This looks like such a fun trip! My family and I escaped the winter Utah cold in January and went to Maui! What a fun trip! My family and I escaped the Utah winter cold in January with a trip to Maui! I love when we can get away! Wow! That is so cool that you got this type of sponsored post - I'm jealous! It looks like a great place to vacation. I need a vacation, maybe we'll look into it. That looks really fun! I've been to the park in Galveston but only during the summer time. Looks nice at holiday time too! Wow, you all had so much fun! Gorgeous pictures! Thank you for sharing your adventures with the world! This is a great topic. I love schlitterbahn. Its a great park and I can't wait to take my girls to it. Great pictures! Looks like you all had a ton of fun! What a fun vacation. It sounds like your family had fun. My family and I have spring fever and are ready to go on a vacation now too. It looks like there is something for everyone! I'm in Buffalo - would love a trip to TX!! What a blessing to be able to get away and enjoy down time with family. Great post and pics! Wow, that looks amazing! We haven't been to the beach in a while... but I love getaways like this. My girls would enjoy the water slide. :) Looks like there's tons of family fun there. Thanks for sharing! Looks like you all had a lot of fun. Now I'm ready to go to the beach. Oh Summer how I miss you! These beautiful views of the beach make me crave some warmth! Looks like a great place to visit. How do you win all those contests and free stuff?! This looks like a great place. We just moved to Texas last fall and are heading out one weekend a month to explore. I'm definitely going to put this on the list. I love sunsets at a beach. This looks like a wonderful place to have a vacation. I can't get over how clear the water is too. Thanks for sharing your trip with us so we could live through you and your pictures. I love seeing how families are spending their time together! Beautiful post. It looks like a great vacation spot for families, I'll have to check into it! For three nights and two days you all sure did a lot and looked like you had a blast! I can't wait to get back to the beach! This sounds like an wonderful trip for a family. Thanks for letting us all know about it. That looks like so much fun. We have a couple similar resorts here in New England I would like to check out. Thanks for sharing. It looks like you all had a wonderful time! Family vacations are the best! Those memories last a lifetime. Thanks for sharing this with us! Glad you had so much fun. I guess I'm one of the lucky ones as I live on the coast. I love the beach any time of year. What an opportunity! I always see this resort on the waterpark shows on the travel channel and would love to go someday. Probably will wait until my 2-yr-olds are old enough to get their money's worth though! This definitely looks like a place where my family and I could really have a good time. Thank you for sharing. This looks like you and your family had a blast. I am so jealous the beach in the middle of winter how cool is that?